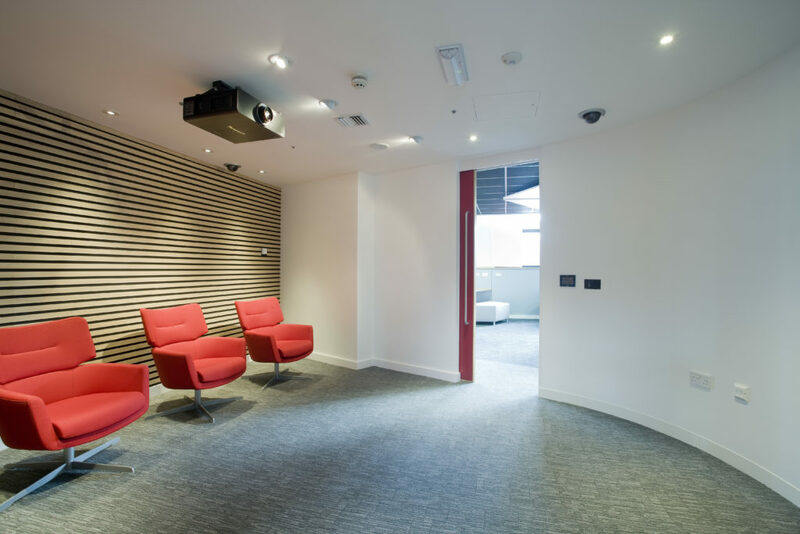 "Bluespace have proved to be professional in their approach to the work required, have been involved in projects from design through to completion and helped with supplying furniture option designs for us to choose from. We have found that they are responsive, helpful and their teams of fitters continue the companies ethos whilst working on site." At an ‘interesting’ point in the economic climate, the City College Norwich Start Up Lounge is a creative interior design to help students make sense of their employment prospects and possibly give them the edge. The space was created by removing as many non-supporting walls as possible from the first floor of a 1970’s three storey block – everything was stripped back to basics and over a relatively short period, a state of the art, contemporary space emerged. 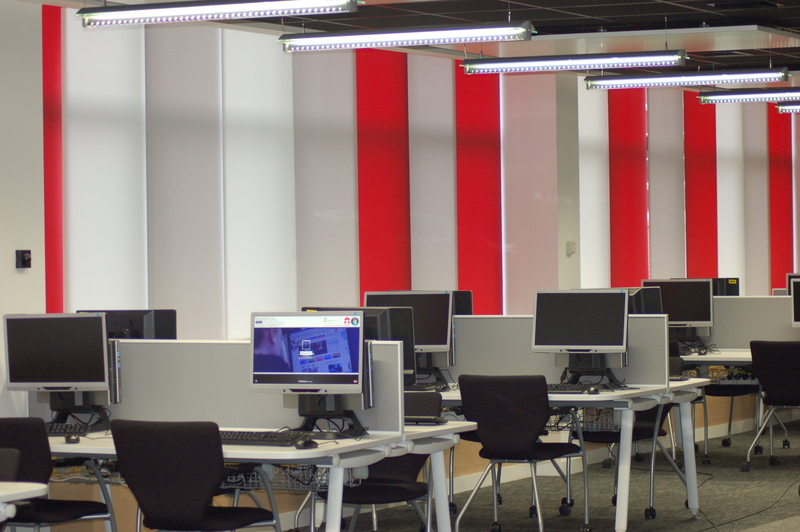 The space is roughly divided into two zones relating to employability and entrepreneurship. Employability being the more studious and professional approach to finding a job with workstations where students can have help to write their CV’s and discuss apprenticeships or current job opportunities. The larger entrepreneurial space relates to developing other, more creative routes to employment such as starting your own company. 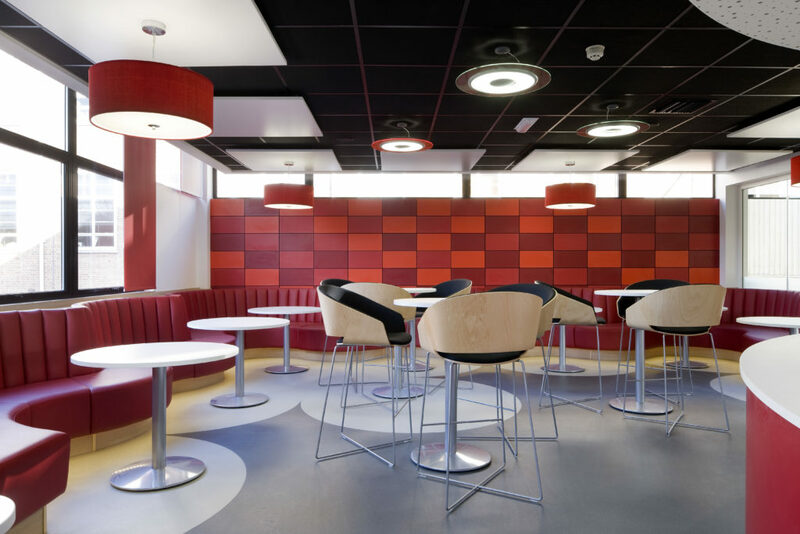 The design is flexible to accommodate individuals or groups – it is the intention that all 14,000 students will have access to the Start Up Lounge at some point during their time at City College Norwich. The hub of the space is the combined reception point and cafe counter serving light snacks, hot and cold drinks etc, run by students as an entrepreneurial enterprise. 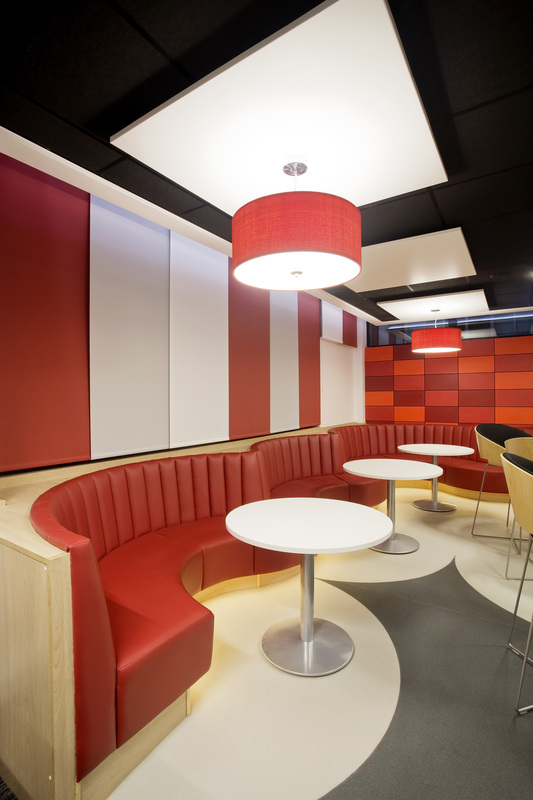 The curvaceous banquette seating is easy to use in bold coloured vinyl used throughout the space, to best effect. All finishes have been carefully chosen to promote a professional look but be easy to maintain – all upholstery is vinyl coated on the reverse to stand up to the demanding treatment students give it. The large multi-use space is enclosed by floor to ceiling frameless glazing; the resulting space has an acoustic ceiling, contemporary bench seating and the largest flat screen in the area at 103 inches. Adjoining this unusually shaped space is ‘The Den’, where students can pitch ideas to a panel of experts. 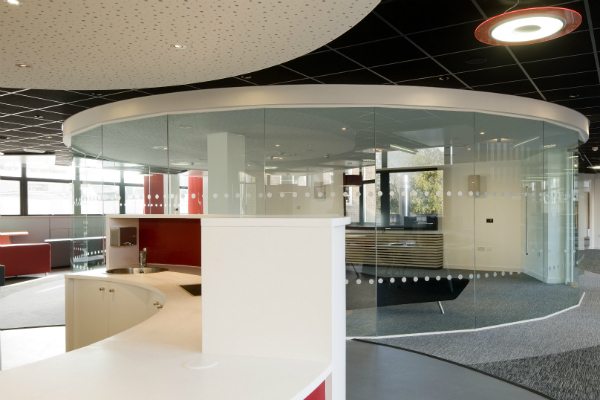 At the rear of the suite are cellular spaces for a host of uses – one being the temporary base for local or indeed national companies, where students can have more individual interview sessions. 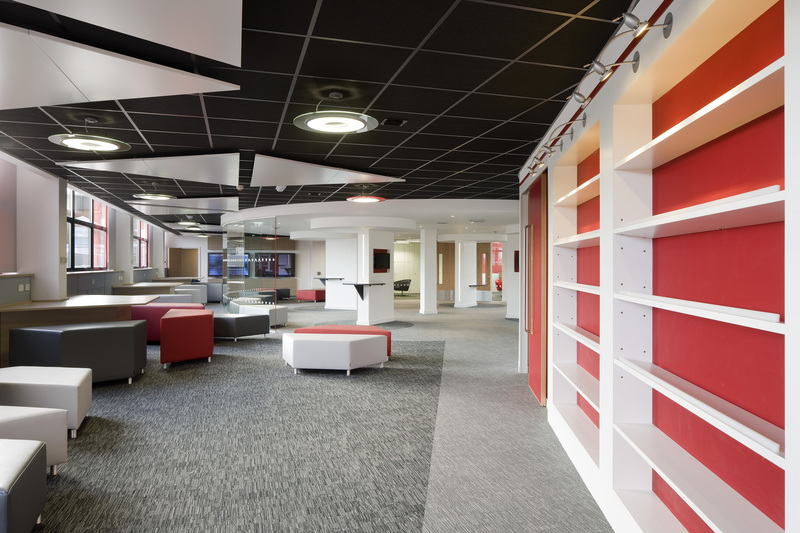 All the facilities are supported by state of the art touch screen technology in the form of wall or panel mounted flat screens, WiFi throughout, easy accessible bookcases with the latest books, periodicals and leaflets and even a striking curved writable wall! Invisible to end users are energy saving radiant heating panels, ceiling mounted as decorative elements and fresh air ducting hidden above a striking black ceiling. The space has been very well received by all concerned, we were delighted to carry out another bespoke design for a commercial property, and it is now over to the college to refine and hone the space to meet their needs which are still being defined by our current economic climate.